Japanese Prime Minister Shinzo Abe and French President Francois Hollande met during a summit meeting at the Elysee Palace in Paris on Monday and agreed that the two countries will work to promote the research and development of fast breeder reactors. According to Japanese sources with knowledge of the agreement, Japan will provide technical assistance on France’s fast breeder reactor development projects. France has also demanded that Japan use the Monju fast breeder reactor to test fuel for France’s Advanced Sodium Technological Reactor for Industrial Demonstration (ASTRID). 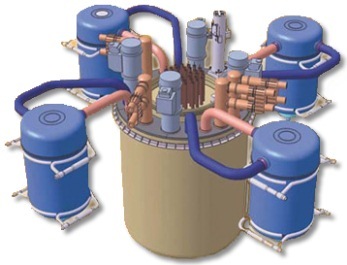 The ASTRID reactor concept is the same as the Monju reactor in Japan. There have been serious questions raised about whether the Monju reactor will be fit to use for research purposes, let alone commercial use. Japan has spent nearly 10 trillion Yen on the project, and in return the Monju reactor has been kept offline for most of the past 19 years due to repeated failures , safety problems and organizational issues. Currently, the Monju reactor is shut down while the operator, Japan Atomic Energy Agency (JAEA) continues organizational reforms and improves its safety management. To meet France’s demands, the Japanese government has agreed to accelerate the reforms at the JAEA and get the Monju reactor to pass safety checks by the Nuclear Regulation Authority (NRA). After the project is underway, the JAEA, Mitsubishi Heavy Industries, AREVA, and others will collaborate on joint research together to create the basic design of the ASTRID reactor. France is working to complete the basic design for the ASTRID reactor by 2019, and hopes to put it online in 2025. Currently all nuclear reactors in Japan are offline, but one of Japan’s hurdles to restarting its nuclear reactors is the decision of what to do with all of the highly radioactive nuclear waste generated by commercial operations. Japan does not have a repository for storing nuclear waste underground and is hoping that fast breeder reactors will reduce the amount of radioactive waste produced at its commercial reactors. Others are concerned that while fast-breeder reactors may reduce the amount of radioactive waste overall, they still produce plutonium in greater quantities than commercial reactors, and experts are worried that may present a serious proliferation risk.